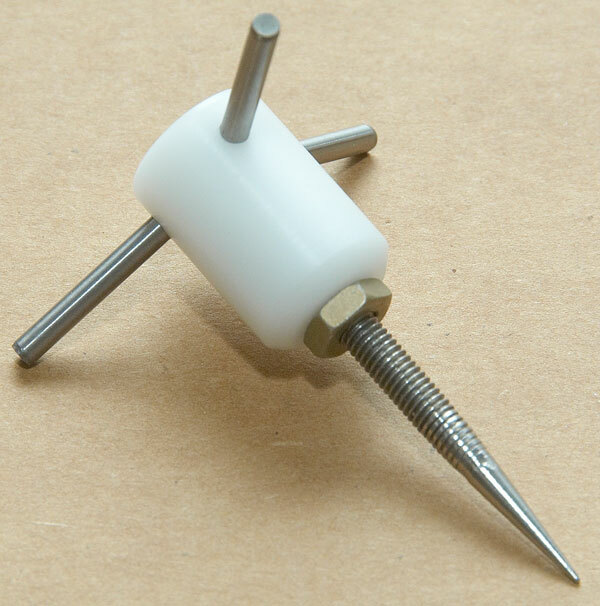 Touch probes are typically used with milling machines for finding accurate references or to measure objects. There are also very accurate "Measurement Machines" that used them to very precisely measure components. They are used to find, for example, hole locations and size, reference planes and so on. They are also used to scan an object by repeatedly measure point by point on the surface and building a data file that can be imported into a CAD programs for further 3-D modeling. 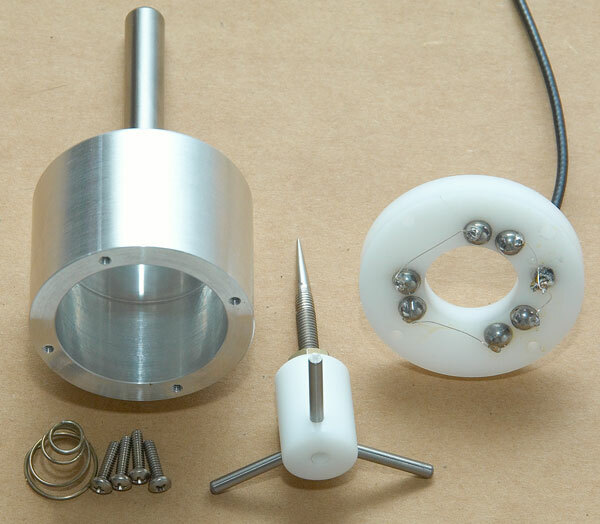 There are several commercial touch probes available that cost several thousand dollars, there are also some low-cost models for hobbyist for a few hundred dollars, and there are many descriptions on how to build one. I looked at many examples and some are beautifully made but often rather complicated and with many parts. I wanted a simple to manufacture one but still not giving up any accuracy so here is what I came up with and built one long night. 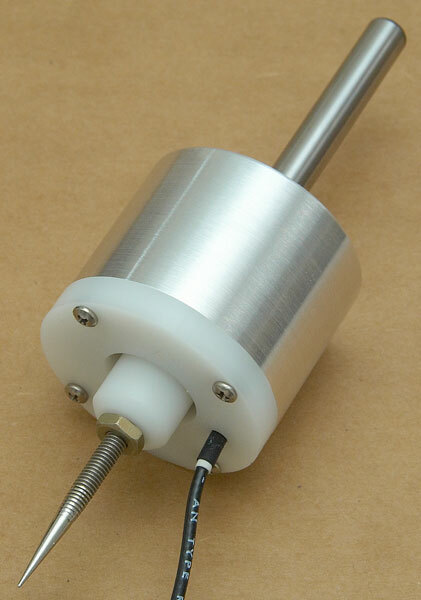 Many of the "DIY" designs have additional parts to be able to calibrate the probe to "zero". 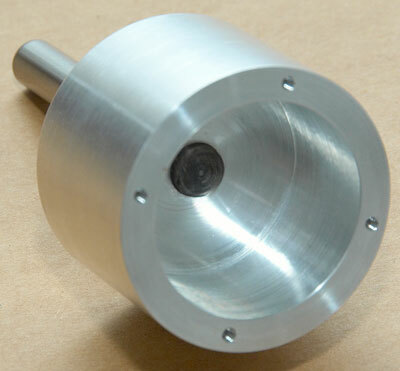 The obvious advantage is that the probe tip will be centered on the vertical axis of the milling machine but at the same time there are many serious drawbacks: It complicates the design, the design will be less rigid, and therefore not as stable and accurate, and it is time consuming to try to adjust a probe to be perfect. With today's CNC equipment it is easy to quickly calibrate a non-adjustable probe and to save that value for the future. Often that saved value is more accurate than a manually adjusted probe since it is very difficult to adjust it to be 'perfect". The main shell is made from aluminum, 50mm in diameter and 37mm long. It is hollowed out and also drilled and then reamed for a 3/8" (9.52mm) tooling pin that is permanently attached with high-strength Loctite. The ball holder plate is made from 7mm thick Delrin or if available some harder plastic. It has six holes drilled so the 6.35mm balls will be half submerged in the plastic. The balls are located on a 29mm circle. The adjacent balls are 7.35mm apart so the gap between the balls is 1.00mm. Before each ball is assembled, it is carefully cleaned, a small drop of soldering fluid (zinc chloride type, not rosin based) is placed on the ball and a very small spot of solder is flowed onto the ball using solid core or acid core solder. It sounds more difficult than it is. Practice on a couple of balls. Afterwards, carefully wash off any flux residue. 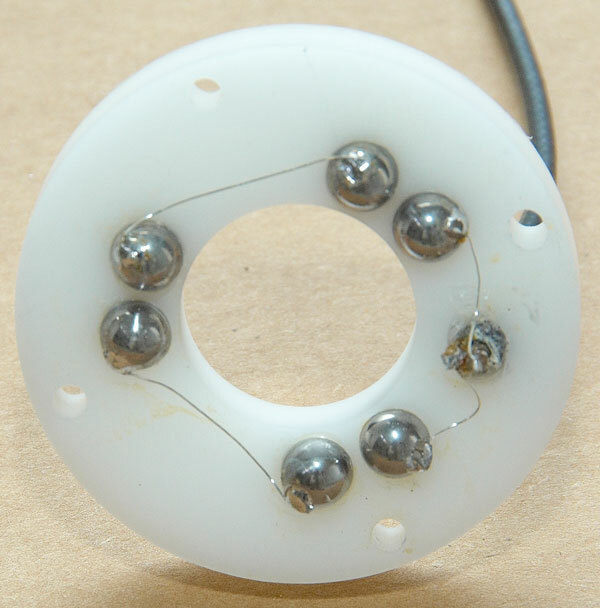 Place a very small amount of epoxy or superglue on the inside edges of the holes and push the balls into the holes with the solder spot pointing away from the adjacent ball. The connection cable has been fed through a hole and it has been glued in place so it can not wiggle. Solder a very thin wire, (faster heat up time and easier to work with than a thicker wire), from the input cable, to each ball going around the center hole and finish on the other wire in the cable. It is easier to handle a long continuous wire than little pieces. Afterwards, just cut out the wire between the adjacent balls. Since the balls are in the plastic they cannot be heated too much or the plastic will melt. This time, place a small amount of rosin flux on the solder spot and lay the wire across it. Using a soldering iron with a reasonably sized tip that will hold the heat and set the soldering iron temperature to high, just touch the wire and solder spot for a fraction of a second. The solder will "instantly" melt and join the wire to the ball without significantly heating up the ball. Afterwards, wash off all flux residues. It is also possible and practical to pre-solder the wires to the balls before they are mounted into the plastic. By using soldered wires any question about contact resistance with a PCB used in some designs are avoided since the soldered connection is guaranteed to always be good and never marginal or intermittent. This type of construction requires minimum amount of parts and all the electrical connections are on one separate little plate. The final piece to make is the central contact bar holder. It is also made from Delrin with three 1/8" (3.17mm) holes drilled at 120 degrees apart. In the holes are pushed three contact pins that will provide the bridge between the balls. I used 1/8" dowel pins and I also tried solid carbide PCB drills shanks. They are very difficult to cut: I used a diamond cutting wheel to nick them and then I broke them off like a piece of glass. The dowel pins are much easier to use. Make sure that they do not short together in the centre when pushed in. The dowel pins in the picture has not been cut yet so they are much too long. Still missing on the center piece are two flats near the end to allow it to be held while attaching the tip. For the final assembly a spring is added inside to provide a pre-load on the pins against the balls and everything is held in place with the four mounting screws. As a very first test I glued down a USA Quarter coin and scanned it in a Taig CNC milling machine using Mach-3 software to run the machine. The coin was sampled in 0.25mm steps in both X and Y. The resulting "Point Cloud" file was saved with an XYZ extension. That point cloud was imported into AccuTrans and below is just a corner view of the displayed point cloud. I am using the following programs to operate the system. The milling machine is controlled by ArtSoft's very well supported Mach-3 program from http://www.machsupport.com/. It has a very large user forum with excellent support. To import and convert the point cloud an excellent and very low-cost program with fantastic support called AccuTrans www.MicroMouse.ca is used. Finally for further manipulating of the mesh a program called MeshLAB is used, http://meshlab.sourceforge.net/. It is an Open program with many interesting features that I am just starting to learn about. I am happy with the design but a possible improvement would be to use a connector mounted in the contact plate instead of the permanent cable. Another drawback is that if the tip is pushed too far, it can jump out of the groves. It is very easy to move tip back and of course it should not happen. On the other hand it will make the probe a little more crash proof since there is large amount of safety movement available. Engineering consists to a large extent of the requirement to evaluate different approaches and make compromises between them: Adjustability vs. Stability and Simplicity. The reliability of a soldered cable vs. the convenience of being able to unplug the cable and so on.